St. Patrick Parish was truly a pioneer parish, with the first Mass offered in 1842 in what now is the Town of Erin. Mass was said at the home of William McGrath by Father Martin Kundig six years before Wisconsin gained statehood. Father Kundig also established St. John's of Monches and St. Benedict of Lake Five, now known as St. Columba's. In 1847 a six-acre parcel of land was acquired and recognized as Erin, Wisconsin with half of this acreage designated a burial ground. The first burial recorded at St. Patrick's was Michael Breshlien in 1850. Monches pastors who served St. Patrick Parish were Father Thomas Morrissy, 1845-1850; Father Patrick Callahan, 1851; Father William O'Brien and Father P. Kernan, 1852; and in 1853 Father Hobbs became the first resident pastor of St. Patrick Parish and lived in a log house near the church. In 1856 Father Hobbs left and St. Patrick's reverted to a mission of St. John's and was served by Father Francis McGown followed by Father John Tiernan. 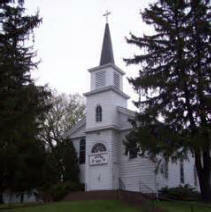 The large frame church as it now exists was completed in 1857 and still has its original structure underneath. The Ladies Altar Society, which still thrives today, was established on June 1, 1868 and was formed to provide the necessary articles for divine service and adorn the House of God. Also in that year, St. Patrick's along with St. Mary, Help of Christians, became missions to St. Kilian's of Hartford. In 1873 the two side wings were added to St. Patrick Church, and on October 31, 1895 the 12 stained glass windows arrived. The articles of Incorporation for St. Patrick's church are dated November 24, 1899. Bishop Henni acquired four different pieces of land that Archbishop Katzer deeded to St. Patrick's. In 1906 the Carmelite Fathers took over at Holy Hill and also assumed responsibility for St. Patrick Parish. This arrangement lasted until Father Frank Kelly was appointed pastor at St. Patrick's on March 20, 1922. The rectory was built in 1923 and parish priests lived there until 1928. At that time the Carmelite Fathers again assumed responsibility for St. Patrick's until 1941. In 1941 St. Patrick was again made a mission to St. Kilian's and was served by assistants to St. Kilian's or chaplains of St. Joseph's Hospital in Hartford. In 1959, five and a half acres were acquired east of the church for additional cemetery space. In 1971, Father Oliver Zinnen was appointed pastor in residence. Upon the death of Father Zinnen in 1973, Father Warren Abrahamson was appointed administrator. Upon his retirement in June of 1978, Father Aloysius Ahler was appointed pastor in residence. On October 5, 1980, all parishioners and friends of St. Patrick Parish celebrated and gave thanks for 125 years of blessings and prosperity. Father Ahler celebrated his last Mass at St. Patrick's on January 8, 1984. He resigned, due to illness, and he died on March 10, 1984. The priests at Holy Hill again served St; Patrick's until May of 1984 when Father John Rausch arrived and served until September of 1993. Father Vincent Holubowicz became pastor on September 30, 1993 and served until June of 1996. On June 15, 1996 Father Walter Vogel arrived and served St. Patrick Parish until June 15, 1999 when St. Patrick's was merged with St. Kilian's of Hartford and ceased to exist as a parish. This record is more than just a history of St. Patrick's parish. It is a testimonial to almost 150 years of love, dedication, service and devotion to God beginning with the early Irish immigrants. This tradition was handed down to their Irish descendents and then came to include many good Christians of other nationalities who were gathered into the fold along the way. With God's help and the help of others like you, St. Patrick Parish is confident they will celebrate their 150th Anniversary in 2005.